Valerie Jo Coulson’s bracelet “Firenze” won Best of Show in 2017, and it is just that: the best of the show. It was inspired by the Battistero di Giovanni (the Baptistery) in Florence, designed by the genius architect Brunelleschi. The bracelet captures the attention to detail, symbolism and the graceful patterns from this grand building but in a contemporary, wearable piece of art. As Valerie states, “The bracelet conveys the passion and inspiration I experience when I see architecture from the Italian Renaissance.” Valerie is no stranger to the Saul Bell Design Awards, having won First Place in Silver/Argentium® Silver in 2014 and having placed as a finalist in 2002’s Gold/Platinum category. I fabricated in sterling silver and inlaid with stone. There is Australian tiger iron (so called for its high iron content), purple agate and a patterned agate or flower agate. I hand-fabricated the bracelet with a portion of the bottom being hammered and formed. The stones were cut individually to fit into the windows created in the structure and inlaid. I would like to say that it started when I was 10 years old and my parents gave me the children’s edition of The Agony and Ecstasy. It opened up the world of the Italian renaissance and arts to me. I always wanted to go to Florence after that. Finally, in 2011, I went with my husband. I researched for months in preparation and it was truly an apex of my life. 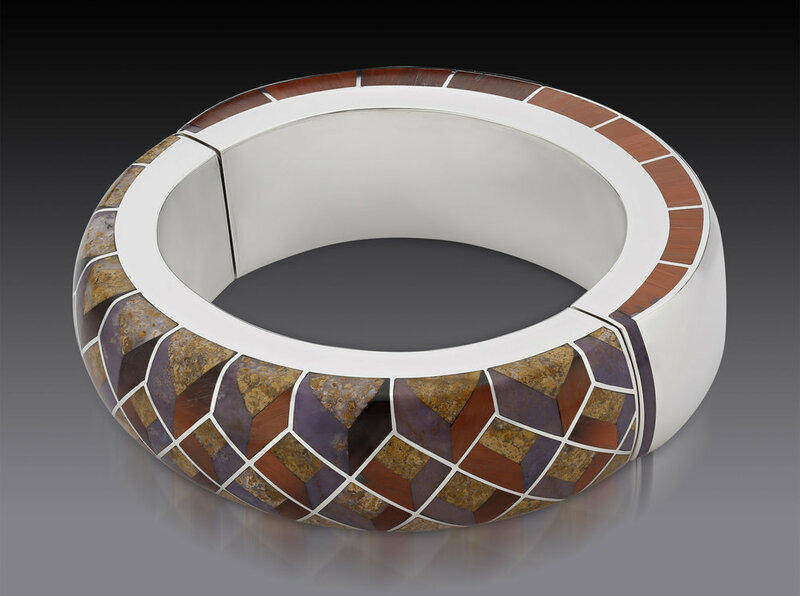 The trompe l’oeil design of the upper half of the bracelet was inspired by the mosaic ceiling of the Baptistery di San Giovanni, which is adjacent to Brunelleschi’s Il Duomo di Firenze. This design runs in a concentric band delineating two tiers of the mosaics … the choir of angels and the stories of Genesis. The lower half of the bracelet incorporates nine inlaid sections and are in deference to the nine differently shaped bricks that Brunelleschi devised for the masonry of the dome to be laid in interlocking herringbone. This method allowed for the rise and inward curve of the masonry to be built without other structural support. Such support was unfathomable considering the height and expanse of the dome. Are you going to sell your bracelet? If it is meant to be, yes, I would love for it to be owned by someone. The bracelet encapsulates the passion and inspiration I derive from the architecture of the Italian Renaissance and Florence. It also relates for me, the absolute awe in viewing the Pietra Dura, the art form of cutting and fitting together of stones to create illusionistic images … "stone painting," as it’s been defined. Oh, yes. I needed to try it on many times to work out all the mechanical issues with the openings and closings. I live outside of Lancaster City, PA, in a town called Pequea. We bought our current house, which is 300 years old, and have been restoring it over the last 30 years. My studio has a stone foundation, which was initially for a barn. An Amish group built and raised a post-and-beam barn-like structure for us in three days. Yes. I started at Penn State University, State College and then transferred to Millersville University in Lancaster where I continued my Fine Arts major. It was about two years later I got into a jewelry-making class because it was always filled. I had three semesters of jewelry and I knew immediately this was the medium I wanted to pursue. I learned the fundamentals at school. There was a setup for stone cutting and polishing, and I began to cut cabochons. From that point on I am self-taught. I am very interested in art history. My father was an artist who taught me a lot about painters. One of the things he helped instill in me was a love for the French Impressionists. He was a painter, not by profession; he worked most of his life as a designer of flooring and wall coverings. He taught me principles of perspective and design, drawing and silkscreen. Decorative arts are also extremely important to me. He would say to me, "Simplicity is beauty." Minimalism is very difficult to get right. My mother played an important role in my life as well. She’s an excellent seamstress, couturier and quilter. I was using a sewing machine at a young age making Barbie clothes. Learning to sew taught me the importance of looking at the pattern pieces, converting the two-dimensional to the three-dimensional. I utilize this same process in metal today. I learned so much from both of my parents. I worked in hospitality, cooking and for a manufacturer soldering electrical parts for radios, which was before I started studying jewelry. I also do digital imaging for my husband who is an architectural photographer. When I am challenged. If I have been invited to enter a piece for a specific exhibition or theme, I live the challenge. And I am also creative when I am in the presence of beautiful art, architecture or in nature. We live in the country, which is a huge inspiration. I consider my business to be a studio art business. My company name is Valerie Jo Coulson. I do mostly one-of-a-kinds and custom work. “I seek a purity of design with an aesthetic which is intrinsically governed by the principle of Sacred Geometry; present in all manner of living/non-living things, biological and cosmic. It is a thoughtful process, not lending itself to spontaneity but rather an orchestration of aesthetics, design, engineering and construction. “Contemplations on forms, patterns and proportions give rise to applications of problem solving. Contextually … the work is about what we seek … balance, order, beauty and purpose. This exploration is visually represented in my work through the viewpoint of upward perspective. Stars, skylights, beams, arches and vaulted ceilings become archetypes of a spiritual quest. I’ve been represented by a number of galleries including the Aaron Faber Gallery in New York City and Mobilia in Boston, and I have exhibited at shows like the Philadelphia Museum and Lincoln Center shows. I was exhilarated, elated, and then very humbled. The caliber of work is extremely high and I have closely watched it over the years. I have entered three times. In 2014 I won First Place in the Silver category. The first time I entered it was 2002, the second annual competition. I entered a pair of cuff links that were a finalist in the Gold category. I love the fact that the Bell family has organized this design competition to honor the legacy of their father. I have won Best in Jewelry at the Philadelphia Museum show and Best in Jewelry at various other retail craft shows. Silver and gold. But if I were to pick a stone, I love to inlay opals and Australian tiger iron because they have such a life to them. These stones have to be carefully cut and oriented to maximize their look. I love the architecture of my studio, the post and beam. The space is airy and has good light and it is out in the country. It is lovely and peaceful. It is my inner-sanctum. I would like to be more organized than I am right now. The tool I couldn’t live without would be my jeweler’s saw. I often listen to music from classical Spanish guitar to Celtic to New Age music, usually international. Instrumental. Every now and then, I need to turn on a fabulous female artist like Adele or Amber Carrington to sing along to and release some stress. I would say don’t be afraid to challenge yourself and in doing so, be confident that there is a solution to every problem along the process. You can find a solution! Fabergé. I love the Russian tradition of decorative work. Wallace Chan based in Hong Kong; an extraordinary stone cutter/carver and metalsmith. I would like to see his studio and talk with him. You can see more of Valerie's work at www.valeriejocoulson.com.